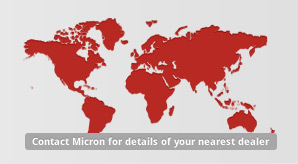 A wide selection of sprayers for weed control and foliar applications are available form Micron. From the hand held 'Herbi' to the tractor/ATV mounted 'Enviromist' range of shrouded spray applicators. A hand-held controlled dose applicator for precise spot application of spray liquids. An electrically operated controlled dose applicator for the professional user. A mains electric or battery-powered air-assisted CDA sprayer for low and ultra-low volume application of insecticides and fungicides. Flexidome is a shielded tractor-mounted sprayer for herbicide application in soft fruit grown in raised beds outdoors or in Spanish tunnels. A hand-held CDA sprayer for the low volume application of herbicides. The Herbi applies large droplets to minimise any risk of spray drift or operator exposure. Herbidome 350 is a shielded CDA sprayer for weed control, suitable for use in a wide range of weed control situations including fruit, orchards and forestry. A rotary atomiser is mounted under a flexible circular shield which rotates freely resulting in efficient weed control and significant labour savings. A hand-held CDA sprayer for the low volume application of herbicides in narrow bands. The Herbiflex 4 applies large droplets to minimise any risk of spray drift or operator exposure. A metered dose injection applicator for eliminating invasive weeds such Japanese Knotweed, Giant Hogweed and Horsetail. A good quality, general purpose, lever-operated knapsack sprayer suitable for a wide range of agricultural and horticultural uses. A versatile modular hand-held CDA sprayer system, consisting of a common Microfit handle which can be combined with the Herbi, Herbiflex or Herbi Twin spray lances to achieve different spray widths. Designed for vehicle-mounted applications, Micromax is a spinning disc rotary atomiser for the Controlled Droplet Application (CDA) of all agrochemicals. A knapsack mistblower with CDA rotary atomiser attachment for professional users in agriculture, migrant pest control and public health applications. An air driven CDA rotary atomiser for incorporation into vehicle mounted airblast sprayers for low volume application of insecticides and fungicides to bush, vine and tree crops. A tractor-mounted airblast sprayer for ULV (Ultra Low Volume) pest control in tall trees including tropical fruit, date palms and forests. Vertical projection of up to 20m. A versatile mistblower attachment for low and ultra-low volume pest control. A hand-held weed wiper for application of systemic herbicides. A hand-held spot applicator for bracken control and spot weeding. A range of circular, shielded sprayers for efficient and economical weed control in bush crops, plantations and amenity areas. A range of ajustable width, shielded sprayers for effective weed control in orchards. The modular Spraymiser Boom shielded band sprayer offers an efficient and economical way of treating weeds in vineyards, bush crops, orchards and amenity situations. A 100 litre Tank System for the full range of Micron CDA and high flow sprayers. Suitable for low volume equipment (particularly CDA units) and spot spraying, Micron Tank System for ATVs and small utility vehicles offers users enhanced productivity and and spraying efficiencies. A hydraulically powered air-assisted CDA spray head using a rotary atomiser for low volume application of insecticides and fungicides to bush, vine and field crops. Can be retrofitted to existing vehicle mounted airblast sprayers or supplied as part of a complete sprayer. A hand-held CDA sprayer for very low volume (VLV) and ultra-low volume (ULV) application of insecticides and fungicides, using the wind to carry spray away from the operator for maximum safety in use. Available in CDA and high pressure nozzle options, the Undavina range of shielded sprayers has been specifically designed for herbicide applications round the base of vines and fruit trees. A range of shielded tractor-mounted sprayers for row crops. A hand-held weedstick for application of systemic herbicides. A non-drip weed wiper with supply-on-demand chemical feed utilising patented sensors and electronic control system. An air driven CDA rotary atomiser for incorporation into vehicle mounted or hand-held airblast sprayers for low volume application of insecticides and fungicides to bush, vine and tree crops. A wide range of accessories to complement our product range.